Shopping, pageants, parties, family gatherings, and food, food, food. The holiday season is filled with good things, making it the holly-est, jolly-est time of year. And it’s easy to get caught up in the tinsel, lights, eggnog, and chocolate and forget about barbells and running shoes. This is why people gain an average of one pound (overweight folks gain even more) during the winter holiday months. You may not think a pound is that big of a deal, but pack them on year after year and they add up. Along with stockings, trees, and carols, why not create new family traditions that include exercise? After your big family meals, plan to take a walk, go on a hike, or ride bikes together to burn off the extra calories. Spending time outdoors beats sitting around on the couch and you won’t regret it. In case you’ve not heard, stress can be a major contributing factor to overeating. For many, the holidays can bring on all sorts of stress. The good news is that you don’t have to hang onto that stress and use it as an excuse to overeat. When going into a situation that you anticipate will be stressful, gear up beforehand with a run or quick trip to the gym or try a quick 4 minute workout. The good vibes coursing through your veins afterward should help ward off negative stress and help you make better dinnertime decisions. Ideally, you will be able to get workout in four to five times each week. However, the holidays often make this difficult. Not only are you on the road part of the time, you also have parties to prepare for and presents to wrap. Don’t let this cause you to fall into complacency. Wherever you are, you’re able to exercise. Remember: jumping jacks, push-ups, sit-ups, lunges, chin-ups, and running requires no special equipment. You can find the perfect “do anywhere” workouts here. In today’s world, many people prefer to sit in their pajamas and do all their holiday shopping online (I’m 100% guilty of this!). Don’t be one of them. Appealing as it may be to shop online, you can burn off a few more calories if you’re willing to shop at stores. Sure, there will be loonies out who are willing to do whatever it takes to get the last toy or sweater available, but shopping at actual stores forces you to walk and get rid of calories while you’re doing one of your favorite things. Of course, you can still squeeze in a quick fat burning workout in just a few minutes. Try this 4 minute HIIT workout every other day for the next week and help hold off the holiday weight gain. And if you can squeeze in 10-15 minutes, do the circuit two to three times and you’ll get your metabolism revving and ready for your holiday festivities. As always, make sure you consult your physician before beginning any workout program. 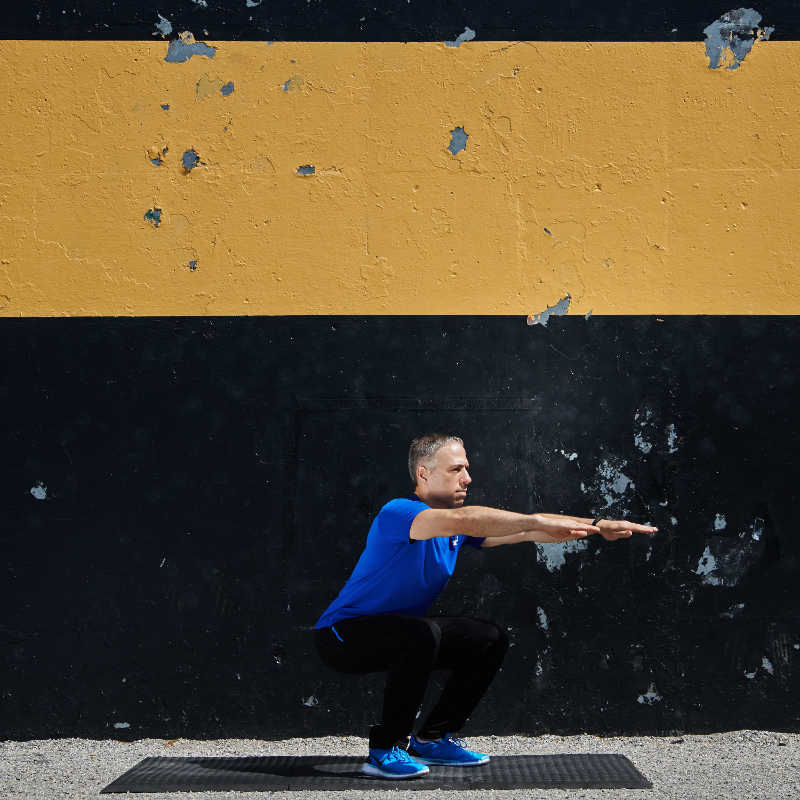 You will perform two rounds of these four body weight exercises within a four minute period for a total of eight rounds. Each round will be 30 seconds long, where you will perform 20 seconds of work then 10 seconds of rest. It’s important that you’re providing maximum effort while keeping your form. Focus on the movement and muscles you’re using. Be present for each movement. This exercise is the main strengthening exercise when wanting to strengthen ones chest, biceps and triceps as well as core muscles. Start with a basic push up, lay face down on the floor, or a mat; with your feet together curled slightly so you rise onto the ball of your feet. Place you hands shoulder width apart on the either side of your chest. Inhale as you raise your body up till your arms are straight. Keep your head and neck level with your body (don’t look up or down) and don’t allow your back to rise or fall. Exhale out as you lower your body back to the ground. *If you have a problem performing a pushup with good form, rest on your knees instead. This is a great overall exercise for the lower body that uses dumbbells instead of a barbell. You can also skip the dumbbells and use just your bodyweight. Beginners may find this version easier to perform. Grasp a dumbbell in each hand. If you don’t have a dumbbell, just keep your arms straight in front of you, like two straight swords pointing forward. Stand with feet slightly wider than shoulder width apart with your knees and toes pointed slightly outward. Drawing your abs in descend slowly by bending at the knees and hips as if you are sitting down (squatting). Flex your abs during the movements. Run in place, as fast as you can, raising your knees as high as you can. That’s it! A simple but effective full body, body weight only, fat loss workout that you can squeeze in anywhere, at any time of day. And of course don’t forget your pre and post workout nutrition. At the very least you’ll want to have a quick source of protein ready. And for those of you who celebrate Christmas, have a happy and healthy Christmas holiday!